My daughter asked to stay home. I was a bit surprised. After all, days earlier she and I had hit the mall and scored quite the haul during the after Christmas sales. I thought that shopping trip was the start of many more mother-daughter trips now that she was a tween, heading toward the teenage years. But she was still only 11 years old, I reminded myself. How much retail therapy did a 5th grader need? Obviously, not as much as her midlife mom. I got the socks at the Hallmark store. I missed the fun of shopping with my compatriot, but I still persevered. When I returned home, I realized how silly I’d been to wish my daughter had come. That’s because she was prone on the floor, with about 30 Squinkie toys displayed around her in groups. Excitedly, she told me about the world she had created. These Squinkies were the sporty ones, she pointed out. This group were the princesses, the others were a mishmash group, and so on. Each group had a theme and an impressive backstory, which my daughter told me with glee. The shopping buddy I thought I missed evaporated, replaced by the blissful image of a little girl who stayed at home to create, dream, and play. I know that maybe next year, probably in two years, and definitely in three years, this little girl will be gone. I will miss her as her body and mind will be transformed by hormones and age. The Squinkies will collect dust. She will come shopping with me more often. We will buy mundane things like socks. So here’s to being 11 years old. To playing. 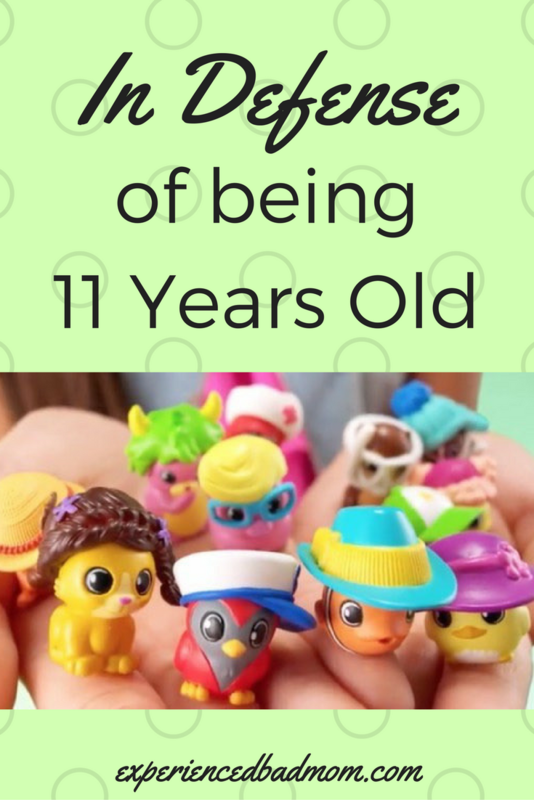 To staying home to create a fantastic world with Squinkies. They walk and talk like adults but their minds still work like children. My 10 year old is exactly like this. And often I feel like the more they look like adults the more they revert to childlike behavior! Thanks for taking me back to that time when mine was 11. I’d forgotten, Katy. I think that’s why I keep blogging Kelly. To document and relish the small moments. My sisters a very serious competitive gymnast and 5 days a week has her game face on for 4 hr practice. But she’s 9 and promptly comes home after pushing herself with her teenage teammates to play barbies, squishes, and slime. It’s good to have a balance! But amazing to see how they can switch modes like that! Oh Katy. Such a sweet refreshing glance into your girl’s 11-year-old life. YES- as you know my girl is 14, and those days are GONE. But you will have so many new things to share with her as she shifts and changes. Cass and I are into watching The Office… and we laugh SO hard and snuggle on the couch. I am loving this phase, and I know you will too. But for now- imaginative, creative, adorable play is perfect. Oh my that is so sweet! Yes, let her play with the Squinkies, because the teen years, although fun in their own way, are coming quickly. Eleven is such an inbetween age. One minute they’re reminding you that they’ve grown out of the little kids things, and the next they’re playing pretend with toys. It’s pretty cool to watch how they grow up.